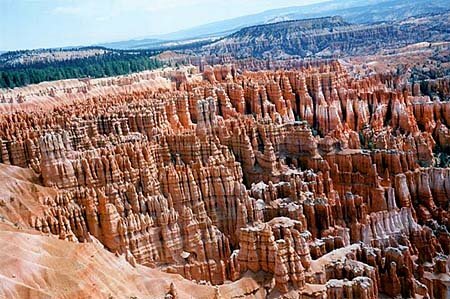 Bryce Canyon National Park, southwestern Utah, established as a national monument 1923, as a national park 1928. It is famous for its unusual rock formations, among the most spectacular and vividly colored of any in the world. Set on the eastern rim of the Paunsaugunt Plateau, it consists of a series of horseshoe-shaped canyons, 300 m (1,000 ft) deep. 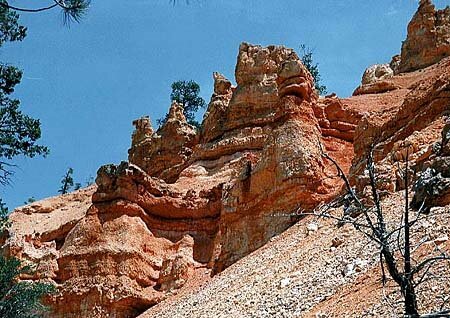 The sandstone walls of these canyons have been sculptured by erosion, and spires and pinnacles are common. The rock strata offer differing resistance to the elements and are variously colored pink, white, orange, and red. Area, 14,502 hectares (35,835 acres). Bryce Canyon in Utah is a splendidly baroque landscape where erosion has whittled armies of fantastic sculptures in huge painted amphitheaters. Pink, white and pale yellow cliffs crumble down into valleys filled with rows of towering spires. Bryce is the top step in the "Grand Staircase"- a series of ascending geological layers that climbs up from the Grand Canyon in the south. The rocks of Bryce and nearby Cedar Breaks are the sediments of an ancient inland seas, shores, and lakes compressed into stone. These thick layers of sandstone were pressed down by the weight of the volcanic ash from erupting volcanoes. As the ash eroded away the older rock layer floated up. It's edges crumbling and flaking like icebergs calving off a glacier. Erosion continually rasp away at the cliffs; filling off a few feet per century. The erosion is fickle- bypassing harder rock to carve out spines and rows of segmented pillars. Curtains of rock curl away from the sloping ramparts of the cliffs. Each layer has it's own shade- A different tint each century, and new color every million years. The chalky rock crumbles down to the base of the cliffs where the colors of the different millennia are mixed like a sand painting. 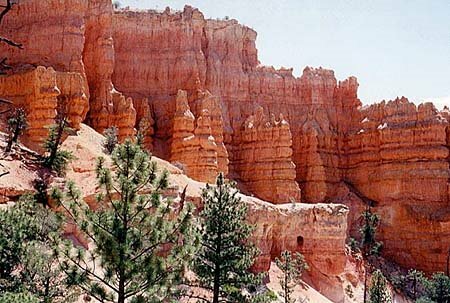 The rock towers seen here are known as "Hoodoos". They often appear in rows as a fin of rock standing out from a cliff is further eroded into segments. Where they are dense enough they create mazes of pocket canyons. A natural bridge formed by an eroding rock fin. A Bristlecone pine hugs the edge of a cliff. These trees can live for hundreds of years. They grow slowly in the harsh conditions of the exposed cliff edges. Ben's, and Ron's Amazing Adventure: Bryce. Arches struck me as a wonderfully alien world. Its an open gallery of sandstone sculptures- painted in red and orange water colors. Splintered towers- both massive and fragile- hang against the desert sky. Ramparts of wrinkled red rock stand alone like the walls of ruined forts. Huge shark fins of sandstone jut up from the stark landscape. This is one of the "Court House" towers, seen from along the Park Avenue trail. The Park Avenue trail is a short hike from the viewpoint down a canyon of red rock. One of the walls bordering the "Park Avenue" trail. The sandstone rows with rounded tops (like giants knuckles), along the bottom of the picture, may one day become isolated rows of stone fins, as erosion widens the cracks seperating them. Entrada, and Navajo sandstone laid down on a ancient seabed have been eroded into the marvelous wierd formations that fill the park. This shark like fin may have been one end of a collapsed arch. This Balanced Rock was seen in the third Indian Jones film. In the opening sequence, a troop of boyscouts is riding underneath, seemingly oblivious to the danger. Naturally, when I saw the movie I assumed it was a special effect matte painting. More balanced rocks, like Gods own sculpture garden. This is Tower Arch, an Arch with a tower directly behind it- like a giants belt buckle. Its a lot bigger than it looks here. To reach Tower Arch you have to take a unpaved road, and hike the final few miles. Small rock cairns mark the trail. Even a few hours in the desert make you appreciate how inhospitable it is. Nearby to Tower Arch there are more of the characteristic rows of sandstone fins in the distance. Here seen edge-on. These may become arches if the sides, and middle wear faster that the top. A moderately strenous hike brings you to Delicate Arch. It is a U shaped loop of stone, about four storys tall. The loop is only about three feet in diameter at its narrowest point. It sits on a shoulder of a hill, looking ready to topple at any moment.king ready to topple at any moment. Arches is just north of Moab in the State of Utah.